These extended length slatwall shelves are perfect for small lightweight items. The simple design works well in any environment due to its ability to blend in seamlessly. The acrylic also will make your displayed items stand out and look their best. Installing these shelves is very simple. The flame polished edges provide a clean and professional finish. We carry many different sizes to accommodate any display situation. These slatwall shelves are ideal for displaying books, videos, software, etc. An acrylic lip offers additional support for your merchandise. This piece is also available with a 10 degree tilt back. Measures 5 1/4"d x 6 1/2"h. Choose from the width options below. An acrylic braced shelf for slat wall display. Constructed from one piece for extra heavy items. Clear acrylic construction is highly durable and gives a clean professional look. 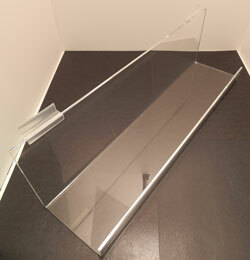 This acrylic shelf is ideal for displaying books and is for slatwall display only. Non-lipped edge allows a full frontal view of your product. Choose from the size options below. An acrylic slatwall shelf ideal for displaying CDs. Shelves are rear tilting to keep product from sliding. 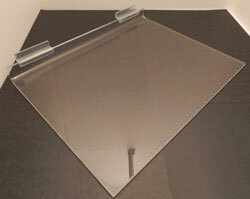 Measures 23 3/4"w x 4"d x 3"h. Clear acrylic construction is highly durable.